I recently had a very interesting request to make a traditional Nunti Bo, used in Okinawan kobudō, a traditional form of martial arts. Prior to the call I knew nothing of these of martial arts, or the traditional weapons used in modern exhibitions and practice. 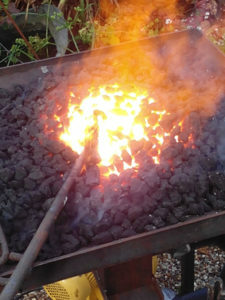 Appreciating the importance of physical balance, alongside the desire for a traditional blacksmith construction process for the Nunti Bo, and with guidance from Gary and Marc, I finished my research and was ready to go. The first thing I had to make was the Bo. For this I found a supplier of traditional Japanese red oak. 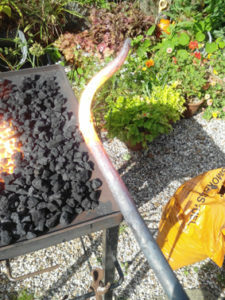 At 6ft long and 30mm diameter, I had my first element ready. For the Sai (the metalwork), I was on more familiar ground. However, since no-one else seems to make Nunti Bo, all I had to work on was a photograph. This required a bit more work to scale up from some overall sizes and I was then ready to fire up the forge and start hitting hot metal. The pictures below show the forging process and the different stages of producing the Sai component to the Nunti Bo. The final finishing of the Nunti Bo was to polish the metal and woodwork with beeswax polish. This ensures that the metalwork keeps its natural forged finish. All in all this was a very interesting project, especially because it was so closely aligned with my interests in keeping traditional crafts and practices alive. I really enjoyed the challenge of a small step into unknown territory, working to such a precise brief to make a historically correct item.